We Have Special Holiday Hours. PLEASE PLACE YOUR ORDER BY SUNDAY, NOVEMBER 18. All orders must be prepaid. Thanksgiving Pies All of our 9” pies have a buttery crust and serve 6-8. Pear Fladen Freeport Bakery’s well-loved hand-shaped rustic pie filled with ripe pears from Boa Vista Orchards, cream, almond paste, Marsala, and currants. Pumpkin Cheesecake Creamy pumpkin cheesecake on a Linzer cookie crust base. Sides are full of our crunchy pecan praline. A great alternative to pumpkin pie! Ginger Spice Cake Our pumpkin spice cake loaded with ginger, clove, and nutmeg. Finished with an incredible ginger cream cheese frosting. Acorn Cake Our Most Popular Thanksgiving Cake Marbled buttermilk and chocolate cake with chocolate mousse filling. Frosted with chocolate ganache and shaped to look like an acorn. Garnished with a colorful fondant oak leaf. Cranberry Cheesecake Tangy cranberries and fresh orange zest are added to a rich cream cheese base. Finished with our special cranberry-orange topping. 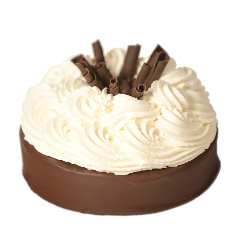 Chocolate Decadence A truffle-like flourless chocolate cake topped off with a generous amount of whipped cream. Carrot Cake Layers of old fashioned carrot cake packed with apples and carrots. Frosted and filled with real cream cheese frosting. For Harvest Decorations on 7” or 9” cakes, add $6.00. Larger sizes of the above cakes are available. Please ask for sizes and prices. Specialty Breads and Rolls Variety Pull-Apart Rolls Twelve of our French dinner rolls topped with poppy, sesame, caraway, and plain. Leaf Shaped “Rolls” Beautiful and delicious. Made with sweet egg dough. Great for day-after turkey sandwiches, too! Christmas Stollen A rich buttery yeast bread made the traditional Bavarian way. Filled with pecans and golden raisins, candied orange peel, and a ribbon of marzipan. Great with tea or coffee! Wrapped to make the perfect host gift. Quiche Just heat our vegetable or quiche Lorraine. Makes waiting for the turkey a whole lot easier!